Canada is celebrating its 148th birthday this July 1 and Vancouver is preparing for the year’s most anticipated summer holiday. All around the city there will be festivities and parties, bringing communities together to enjoy a fun day out. Here are our Top five events that you shouldn’t miss. Vancouver’s biggest Canada Day celebration is at Canada Place. The festival is free and family-friendly, with live music, interactive games, street food, a circus show and even a beer garden. Celebrations will last all day and music acts this year include local singer Hannah Georgas and Latin-inspired group Rumba Calzada. To celebrate Canada’s diversity and national pride, this year’s annual Canada Day Parade will feature more than 60 performance groups, from marching bands to samba dancers. Make sure you wear your red and white and arrive early for a good spot. The Women’s World Cup Fan Zone is the perfect location for all the soccer lovers out there to watch live broadcasts of the FIFA Women’s World Cup Canada 2015, while at the same time celebrating Canada Day. Enjoy live music, fun soccer tournaments, athlete autograph opportunities, delicious food, beer and more. Admission is free. All day long Granville Island celebrations will offer a variety of different attractions and activities, including a Truly Canadian Pancake Breakfast, an official Canada Day Ceremony with cake, live jazz, bike decorating and a Canada Day Parade (1:30pm – 2pm) to celebrate the 50th anniversary of the Canadian flag. Families with young kids will also love the free Granville Island Water Park. 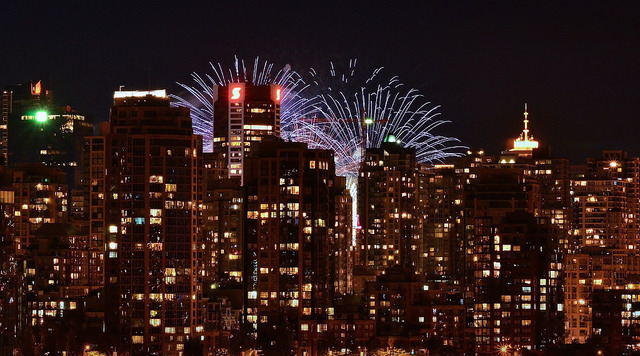 Watching the popular Canada Day Fireworks in Vancouver is the perfect way to round up a day full of exciting parties and events. To escape the crowds purchase tickets ($15) to the exclusive Hudson’s Bay Fireworks Viewing Zone and enjoy live entertainment and premium fireworks viewing in a family-friendly atmosphere.